Today is a very meaningful 5 year anniversary for me, and for my flock. St. Mary Of Pine Bluff Has Officially Made The Move … East. After a year of celebrating daily Masses ad orientem, we wondered when we might take the next step to celebrate all of our Masses this way – including weekend Masses. Then came the December 6, 2012 homily by our own Bishop Robert Morlino. In his homily, our bishop was actually encouraging ad orientem worship. That was all the encouragement we needed.And so, it’s official … St. Mary of Pine Bluff became a parish that celebrates the Novus Ordo ad orientem at all of their Masses. I made the decision to use the great feast of Epiphany, in which we see the Magi journeying toward the star they saw at it’s rising (in the East). And then, one year later, I posted a copy of this letter I wrote to a priest (February 22, 2014). I wrote it because I don’t believe we priests should be frightened anymore. I agree with a recent post that said, while we take our time, souls are being lost. We all know, in our bones, that God wants this … let’s simply obey and allow God to bless our obedience!!! Our choir has doubled in size over the past year, and they are chanting and singing polyphony so beautifully that I am thinking they should make a CD. Even our men’s schola went from 7 members to nearly 20 in just this past year. And, these men have become quite a “band of brothers” as they also gather once a month in my man cave for what we call, “Pipes and Pints” … Most of them enjoy a nice pipe and brew as we discuss church related issues and try to solve all of the problems of the world. Virtually all of these men are young professionals. Two years later, we added a Traditional Latin Mass on Sunday. 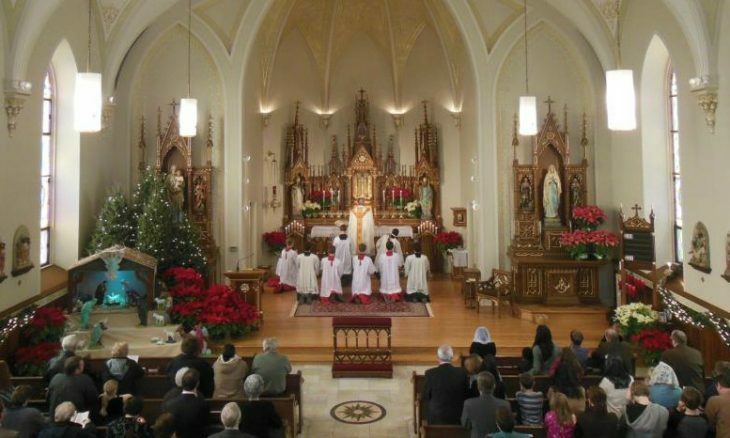 Many of those young families who discovered the “sense of the sacred” in the Novus Ordo ad orientem, have now transitioned to the Traditional Latin Mass. It’s an amazing phenomenon going on here. More families (mostly young) pour in to fill the pews of those who have transitioned to the Traditional Latin Mass. This was all purely an act of faith, on my part. I trusted this was the will of God, and blessings upon blessings have flowed from making this decision. Trust in God! Go Ad Orientem!